Afrin has become the scene of the latest episode of the bloody war in Syria. After two months of intense resistance, the SDF [Syrian Democratic Forces, a multiethnic militia led by the Kurdish YPJ/YPG] have withdrawn from the city that gives its name to the Afrin Canton so as to ensure that civilians have an evacuation route. This strategic maneuver is motivated by the necessity to protect hundreds of thousands of civilians that live in the city among which, scores of refugees from many parts of Syria. Until this episode, Afrin had been an oasis of peace and stability in which more than 300,000 refugees had found a home in the otherwise war-torn Syria. But now the intense shelling and the Turkish airstrikes have forced over a million people to flee their homes. Originally published by the International Commune of Rojava. The invasion of Afrin officially started two months ago, on the 20th of January under the name “Operation Olive Branch”. Since then, a criminal alliance between the chauvinist fascism of the Turkish army and the religious fanatism of the jihadist militias, has managed to gain a foothold. All this while disguising their Al-Nusra/Al-Qaeda and ISIS flags behind the FSA’s own [Free Syrian Army, a name which has served the purpose of whitewashing any group that has not pledged allegiance to the Syrian Arab Army of Bashar Al-Asad]. The advances accomplished by these groups are owed in large part to the superior firepower provided by the Turkish army under the auspices of NATO. In addition to the arsenal of armored vehicles, such as the German panzers and other domestically-produced tanks, control of air-space has been a crucial factor. Jets, helicopters, and state-of-the-art drones have been used to bomb every corner of the mountainous region in which self-defense forces and the civilian population, who have joined the popular resistance, had gathered to repel the invasion. Resistance has been heroic and the seize of Afrin, that Erdogan had announced would only last 72 hours, has required two months to be completed. But the sheer inequality in technology and number of fighters, as well as the huge number of civilian casualties has forced the surviving population to abandon their land and seek refuge elsewhere. Jihadist militias, which have served as the advance troops for the Turkish Army, are a splinter group from Al-Qaeda [or Al-Nusra, its name in Syria], that reorganized under the Islamic State banner in 2014. It should not be a surprise to anyone that they are now fighting under the Turkish flag, as their goals align perfectly with the Neo-Ottoman ambitions of Recep Tayyip Erdogán. The links between these Salafist groups and the government of Ankara have been evident since the beginning of the expansion of the Caliphate. Turkish visas given to jihadists from around the world are just one example. Furthermore, commercial routes created to transport oil from Iraq and Syria to Europe have been crucial for ISIS as they generated a continuous inflow of revenue that ended up both in ISIS and the Turkish coffers. During these two months of resistance in Afrin, invaders have swamped social networks with videos and pictures depicting tortures and assassinations of captured civilians. The enemy that Rojava’s forces are facing today is the same one they defeated three years ago in Kobane, halting the spread of ISIS, and again in Raqqa some months ago. This time they are joined by one of the most powerful NATO armies: Turkey. Read also: Solidarity Action for #Afrin: #Antifa Enternasyonal T-Shirts – Profits go to Heyva Sor or click at the image. Trying to resist in the besieged city of Afrin would have meant the death of hundreds of thousands of innocent lives and the destruction of the city by Turkish airforce bombing. This perspective led the democratic self-administration of Afrin to evacuate civilians and declare the beginning of a new stage in its resistance. Unlike other cantons of the Democratic Federation of Northern Syria that are vastly plain, Afrin is a hilly territory. Moreover, troops posted in rural areas, make a guerrilla-type resistance a much more plausible scenario in this new stage declared by the SDF. The guerrilla strategy is no stranger to the Kurdish forces as they possess decades of experience in this type of warfare. As we enter the seventh year of the Syrian war, it is evident that the end is nowhere in sight. The situation of international forces in Syria is that of a tense and dangerous balance. 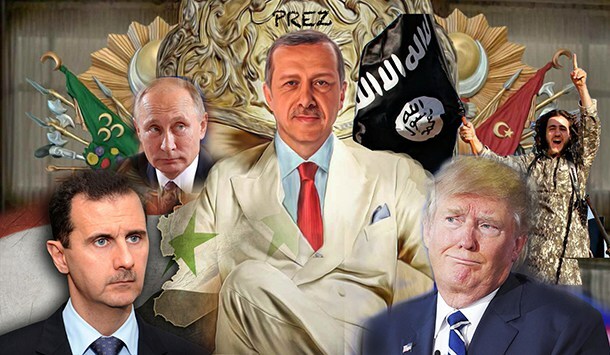 Russia and Iran are providing support to the Al-Assad government, while the USA is giving its back to those who have defeated ISIS in order to fix its strained relationship with Turkey, longstanding ally in the Middle East and member of NATO. If there’s anything certain in this muddled crisis, it is that arm-manufacturers will continue to earn huge profits and that Syria will be used to try out the new military technology. Beneath the macro geopolitical issues at hand, regional conflicts continue to simmer. The conflict between Iran and Turkey, despite agreeing in relation to carrying out massacres against Kurds, is entangled with the religious fanatism upon which both authoritarian states are founded. The conflict between Sunni and Shiite is the breeding ground from which they can continue to engross their ranks of theocratic fascism. Ethnic and religious minorities will be the main and most vulnerable victims. A century has gone by since the implementation of the nation-states system in the Middle East, which sprung after the collapse of the Ottoman Empire imposed by western states. It is now clear that this model has done nothing but increase the number of conflicts and wars. The region is key geostrategically speaking; a crossroads of three continents, strategic commercial maritime routes, and an abundance of fossil fuels make it a coveted region for global powers. International interference and destabilization by imperialist powers are guaranteed. War will continue to be part of everyday life in Syria, bombs will continue to fall and the people will continue to die. The people of Afrin are the last ones to pay the price of war. A war that allows the so-called first world to continue enjoying its privileges and luxuries. The arms trade and fossil fuel commerce will continue its normal course. The European Union will make a brief statement on the last humanitarian crisis in Afrin but as soon as the cameras are turned off they will give Turkey a three billion euro aid-package for refugees. The USA will continue to flounder in the Middle East seeking to maintain its military global hegemony while Trump keeps tweeting nonsense on a daily basis. Russia will continue to consolidate its influence and react to NATO’s actions, with Putin strongly holding on to his power after a more than predictable victory in the Russian elections. China will continue to extend its new silk-road silently keeping a close eye on the Uighurs, who joined the caliphate Islamic in Syria. And the Rojava revolution will continue its course fighting for a better world with women taking the lead, and will get back on its feet after the heavy blow Turkish fascism has dealt in Afrin.